Factors to consider when buying a new oven include: gas versus electric, and freestanding versus built-in. If you're cooking for one or an entire family, it's important to compare ovens that suit your cooking style, kitchen and budget. Electric Vs. Gas – Which Should You Choose? The first choice to make when comparing ovens to buy is whether a gas or electric powered oven best suits your needs. Start from a lower price point than gas ovens. Offer versatility, with a variety of functions and layouts available. They usually include top, bottom, rear and grill elements, plus a fan to maximise different cooking needs. Pre-heating times are generally on par with gas. Require a mains gas connection. Retain moistness in food, compared to a fan forced electric oven, which is perfect for roasts and baking. Choose a model with a fan, in order to circulate the heat evenly. Otherwise you'll need to rotate your food to avoid uneven cooking, as gas ovens usually heat up more at the top. What Are Fan Forced Ovens? Fans distribute heat evenly around an oven, allowing food to cook faster and more evenly. Fans can be crucial in gas units, which tend to be hotter at the top. Without a fan, it's necessary to rotate the food. As the name suggests, these use steam to cook food. Steam ovens are known to reduce cooking time, preserving the flavour of food plus retaining its vitamins and nutrients, as well as being easier to clean afterwards. What's The Difference Between Built-In Vs. Free-Standing Ovens? 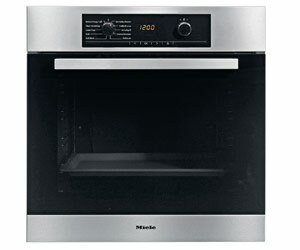 Free-standing Ovens: Are a complete unit with a cooktop combined on the top of the oven. Available in a wide range of sizes, including slimline models. A freestanding oven is often a good choice for smaller kitchens. Built-in ovens: A built-in oven – including wall ovens and under bench ovens – can be mounted into a wall recess or under the kitchen bench. This flexibility of installation means that built-ins suit a wide range of kitchen styles and layouts. It's important that you know the size of the area your oven will occupy, as this will dictate the size of your oven. If you're starting a complete re-build of your kitchen, then you have the freedom to build your kitchen space to accommodate whatever size oven you choose. The most common oven width is 60cm. If you're after a larger oven, 90cm wide might suit. Always check the internal size of the oven. It should be large enough to accommodate the amount of food you'll be cooking. Double Ovens: A double oven is two separate ovens either on top or alongside one another. They're great for entertainers or large families and versatile because you can bake different dishes simultaneously. Generally recognised as the only genuinely self-cleaning ovens. Feature a self cleaning mode, which heats the oven to extreme temperatures (approx. 500°C). Fats, food residue etc. are reduced to a thin white ash, which can easily be wiped away once the oven is cool. Safety features lock the door to prevent opening during the "pyrolytic" process. Utilise specially developed oven liners, which absorb fats and food particles. At temperatures over 250°C the fats and residues are burned off. The liners will need to be cleaned with a damp cloth after this process. How Do You Test The Shelves? Having a range of shelf positions gives your oven more versatility, especially if you're juggling the preparation of several courses at once. Look for solid shelves that sit flat and don't continue to slide out, or sag forward if pulled out slightly. There should be safety stops to prevent the shelf from sliding out completely. Why Are Good Doors Important? While it's natural to want a "solid" feeling oven, the door should be light and easy to operate. Look for one that has a large, clear-view window with multiple layers of glass. Generally, an oven door with three layers of glass will be cooler to the touch than one with two layers. This is particularly important if you have children. Finally, test that the door stays open in any position. The last thing you want is the door slamming shut on hot food. Size: Double ovens are great for large families. Space: More shelves may be handy if you cook several items at once. Safety: Oven doors with three layers of glass are cooler to the touch; important if you have children. Convenience: Self-cleaning 'pyrolytic' ovens reduce food residues to ash, which is easily wiped away when cool. Speed: Convection ovens roast meats up to 25 per cent faster. Multi-functions: Electric ovens offer a variety of cooking functions. Quality: True convection ovens have a third element that surrounds the rear fan. Size: Extra-wide ovens are excellent for larger trays or big batches. 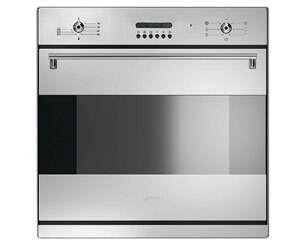 Versatility: Electric ovens use top, bottom, rear and grill elements, plus a fan to optimise different cooking needs. Electric vs. gas: Electric offers different cooking functions; gas can have an electric grill. Convection: Uses a fan to circulate hot air around food and roast meats up to 25 per cent faster. Built-in vs freestanding: Built-in offers flexibility with kitchen layouts; freestanding can be positioned anywhere. Self-cleaning: Reduces food residues to ash, which is wiped away when cool. Double oven: Two separate ovens either on top or alongside one another, but operating as one.